NEW YORK (March 20) : A new particle-smashing experiment has uncovered surprising evidence that nature treats matter and antimatter differently. The findings, detailed today in the U.K. journal Nature, suggests that a complete solution to the mystery of why the observable universe is dominated by matter, and not antimatter, may have to await the discovery of novel particles or the invention of new physics. Antimatter is the weird twin of matter. For every particle of normal matter, there is a particle of equal mass but opposite electric charge. When a normal particle and an anti-particle collide, they annihilate one another in an explosion of pure energy. According to the standard model of physics, matter and antimatter were created in equal quantities shortly after the Big Bang. 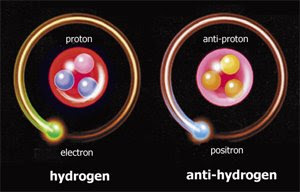 The two types of particles should have thus cancelled each other out and the universe should be permeated by energy. A major mystery of modern physics is why normal matter particles are the building blocks of the observable universe. Why are we not made of antimatter? Or pure energy? Scientists speculate that a tiny imbalance in the early universe allowed a small fraction of normal matter – one particle for every one billion – to avoid annihilation and survive to form stars, planets, and humans. In recent years, experts have attempted to artificially recreate this primaeval imbalance using high-energy particle smashers. In this latest study, a consortium of international researchers called the Belle collaboration, led by Paoti Chang at the National Taiwan University in Taipei, used the high-energy KEK-B accelerator in Japan to collide electrons and their antimatter counterpart, positrons. When these two particles smash together, they create a burst of pure energy which quickly materialises into particles called 'B mesons'. The experiment created four different types of B mesons: neutral B mesons; the antimatter counterpart of neutral B mesons, sometimes called anti-Bs; positive B mesons; and the antimatter counterpart of positive B mesons, called negative B mesons. A study in 2004 showed that neutral B mesons break down, or "decay," into other subatomic particles faster than anti-Bs. Scientists had previously assumed that the differences in makeup between different B mesons were minor. This led them to predict that positive B mesons should decay at the same rate as neutral B mesons (since both are normal matter particles), and that negative B mesons should decay at the same rate as anti-Bs (both are antimatter particles). The new study reveals this isn't true. The team found that neutral B mesons decayed faster than anti-Bs, but positive B mesons decayed slower than their antiparticles. "It's not just that there's a particle-antiparticle asymmetry. It's that there are two particle-antiparticle asymmetries that are different from one another," commented Michael Peskin, a theorist at Stanford University in California, U.S. who was not involved in the study. "That's the thing that tips you off there's something new that's going on." The new results are similar to unpublished data recently gathered by another international team working at the Stanford Linear Accelerator Centre called BaBar, of which Peskin is a member. Considered together, the teams' findings can't easily be explained by the standard model of physics, and could "hint of an entirely new mechanism for particle-antiparticle asymmetry," Peskin said.